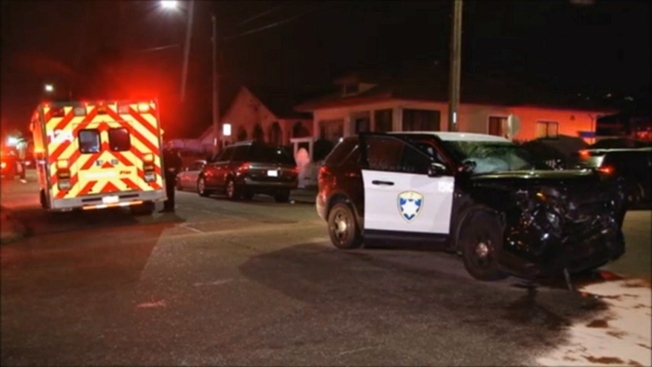 An Oakland police officer was responding to a Wednesday night call about a murder suspect chase when his car struck another vehicle, police said. 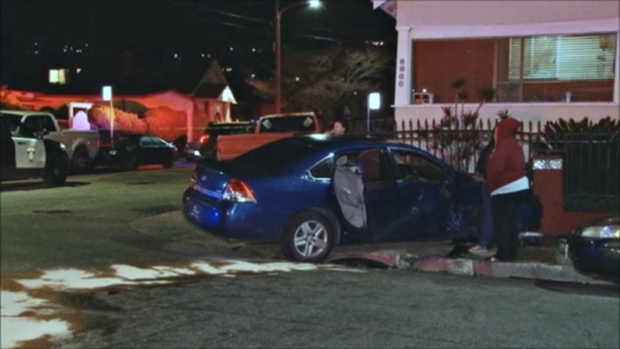 An Oakland police officer slammed into another vehicle while responding to a Wednesday night call about a murder suspect chase, police said. The police department on Thursday said it is investigating the collision, which ocurred around 9:30 p.m. on Hillside Street and 96th Avenue. The police officer and three people inside the other car sustained minor injuries. Pictures from the scene showed a damaged patrol car as well as a blue sedan that had climbed a curb. The suspect in the Wednesday chase was wanted for murder and has been taken into custody, according to police. Further details about the police officer, the extent of the injuries and the murder suspect were not immediately available.